Global pharmacovigilance and drug safety software market expected to generate around USD 223 million by 2025, at a CAGR of around 6.7% between 2019 and 2025. Pharmacovigilance and drug safety software or tools aid in classifying, reviewing, and forming pharmacovigilance data. This software also helps in the formation of repots related to adverse medical events. The report covers a forecast and an analysis of the pharmacovigilance and drug safety software market on a global and regional level. The study provides historical data for 2017 and 2018 along with a forecast from 2019 to 2025 based on revenue (USD Million). 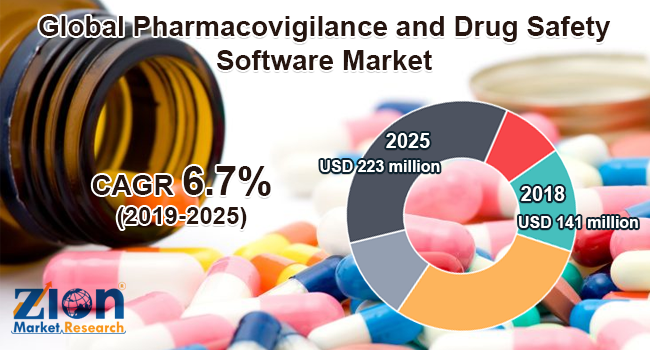 The study includes drivers and restraints of the pharmacovigilance and drug safety software market along with the impact they have on the demand over the forecast period. Additionally, the report includes the study of opportunities available in the pharmacovigilance and drug safety software market on a global level. In order to give the users of this report a comprehensive view of the pharmacovigilance and drug safety software market, we have included a competitive landscape and an analysis of Porter’s Five Forces model for the market. The study encompasses a market attractiveness analysis, wherein all the segments are benchmarked based on their market size, growth rate, and general attractiveness. The study provides a decisive view of the pharmacovigilance and drug safety software market by segmenting the market based on functionality, delivery mode, end-user, and region. All the segments have been analyzed based on present and future trends and the market is estimated from 2019 to 2025. Based on functionality, the market is segmented into drug safety audits software, ADR reporting software, fully integrated software, and issue tracking software. By delivery mode, the market is segmented into on-premises and on-demand. By end-user, the market is segmented into contract research organizations (CROS), business process outsourcing (BPO) firms, pharma and biotech companies, and other pharmacovigilance service providers. Some key players of the global pharmacovigilance and drug safety software market include Oracle Corporation, ArisGlobal LLC, AB Cube, Max Delivery, Relsys, Sparta Systems, Inc., United BioSource Corporation, EXTEDO GmbH, and Ennov Solutions, Inc., among others.